There was a meeting of the ANEFO on Monday, September 24, 2018. First, Skip Likins, ANEFO President, addressed the officials. 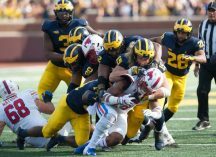 The officials viewed a video highlighting several college football plays and game officials’ decisions. Later, Tom Brow, ANEFO Rules Interpreter, discussed an interesting play that is part of a “You Make the Call” scenario involving a screen pass, a catch, a football move, a fumble, a batted loose ball forward, a catch, and at tackle. Later, a scrimmage play video training clip was presented to the officials. Finally, Skip Likins, Bob Prestera and several other officials shared their views and tips on the umpire position. The handout with the answers to the “You Make the Call” scenario is attached below.